Business leaders must spend more time thinking about the future. To help make this a habit, I have developed the “Future 15”–a policy of taking 15 minutes every week to think about the future. To make the habit simple, I encourage business leaders to follow the 6 “F’s”: Every Friday at Four Forty-Five (4:45 pm) set aside Fifteen minutes to Focus on the Future. To make the habit even more simple, posted below are Fifteen articles. I encourage you to select one or two articles and think about what the news means for you, your business, your customers and your business model. 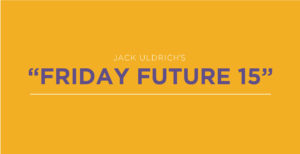 Think: Futurist Jack Uldrich’s Annual Article on Game-Changing Technologies for 2019. As the author of this article, I can guarantee you that at least one of the ten emerging trends I have identified in this article are worth spending 15 minutes thinking about. Think Historically: A Brief History of the Shopping Cart. When first introduced in 1936 men refused to use the shopping cart–it was unmanly. Today, some retail experts think people won’t react well to cashierless stores. This may be true but it might also be true that customer behavior changes and cashierless stores become as common in the future as grocery carts are today.. Think Different: Brands are Looking to Hire Futurists to Foresee Trends and Anticipate Disruption. If you can’t think differently the next best thing to do is hire people who can. Think Harder: Every Company is Now a Tech Company. If you don’t think you’re a technology company, it is time to think harder. Think Like a Child: A Retail Disruptor’s Outlook. A fascinating article discussing how a young innovator looks for opportunities by thinking differently about everything from sleep to how data might be used to reimagine the mattress. Think 10X: Alphabet has announced that it will begin making deliveries by drone in Finland in the spring of 2019. The time to begin thinking about what a 10X increase in drone deliveries might mean for your business is now! Think Bigger: Uber and Lyft drivers in New York City will soon be guaranteed a minimum wage of $17. The trend of protecting “gig economy” workers could grow bigger. If it does what might this mean for you and your business? Think Faster: Just yesterday, Audi announced plans to invest $16 billion in self-driving cars and Waymo launched the first ever commercial self-driving car service. The future is arriving faster than most people think and you, as a business leader, must begin thinking faster about the opportunities this new future creates. Think Radically: Blockchain Deployment Could Add $3 trillion in International Trade by 2030. According to the World Trade Organization (WTO) “international trade could look radically different by 2030.” Something to think about, especially if you are in the logistics business. Think Anew: The designer changing the way aircraft are built. Generative design is transforming everything from manufacturing to urban design. In the future, businesses won’t be in the business of making people want to buy their stuff, they will invite the customer to make stuff they want to buy. Think Sustainably: So Much for That Hope of Reaching Peak Climate Emissions. The global economy continues to grow (which is a good thing) but CO2 emissions are now increasing again. Every business leader must begin thinking about how their business can be more sustainable. This is especially true in agriculture. If you don’t voluntarily make these changes governments, regulators, and customers will soon demand it. Think the Unthinkable: The Digital Maginot Line. This is an incredibly important article. Society is at war. The territory people are fighting over is your mind. The future of democracy is at stake. Want to think again! You can always revisit last week’s Future 15.